Family Role Model Activity: Post-visit Activity Students will write a narrative about a family role model. In November of 2014, Ojai residents approved a $35 million bond fund to renovate and repair Ojai Unified School District buildings and grounds, and provide health, safety and security improvements across our district. One of the larger Measure J projects that is slated to begin later this year is the Matilija Kitchen redesign. "This project will provide centralized delivery and distribution for our Nutrition Services Department," noted OUSD Bond Manager, Adam Dutter. "The design will cut down on food vendor deliveries to multiple sites, and allow for a more efficient and effective use of space”. The central kitchen design of the Measure J project at Matilija supports these values. The new Matilija Kitchen will allow for the preparation of sauces, main entrees and increased produce processing for all school sites. “Although we still supplement using USDA commodity foods to manage our budget, we will be reducing the amount of preservatives, sodium, fat, and cholesterol, and transitioning from processed foods to a more scratch cooking model,” said Ms. Chessen. An example of the scratch cooking model is the daily baking of fresh bread by Nordhoff’s Nutrition Services staff. “It’s not common to see freshly-prepared, daily offerings of bread in school districts,” noted Ms. Chessen. The new Matilija kitchen is divided into three sections: food storage, food preparation and food service. Once the food is received, it’s delivered to either cold storage or dry storage, then is prepared in the food prep area. “One addition our staff is very excited to implement is a new piece of equipment for the district; the Tilt Skillet,” said Ms. Chessen. "Imagine a 30-gallon stock pot” that allows Nutrition Services staff to prepare scratch-cooked meals in larger quantities, noted Ms. Chessen. "The benefit of this new design to our stakeholders is enormous,” said Ms. Chessen. “Instead of spending funds on purchasing processed foods, we are shifting the funding back to our local economy by preparing food choices that are fresher, and that provide higher nutritional content”. OUSD’s Nutrition Services staff prepare and serve approximately 1,215 meals each day. “We are proud of our continued commitment to the students and families in our valley,” noted Ms. Chessen. “And plan to continue serving education, every day, with best practice nutritional offerings." “At San Antonio, we are passionate about building strong school-to-community connections, and we actively seek out opportunities for our students to learn more about the community around them,” noted San Antonio Principal Robin Monson. 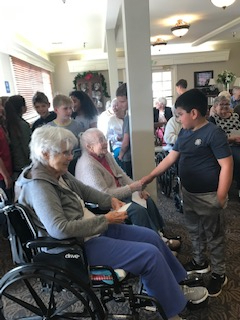 “One opportunity we, as Educators, are excited about is a new outreach with The Gables of Ojai senior living facility.” This year San Antonio’s fourth grade students wrote kind messages in Holiday cards, and delivered them to the seniors living at The Gables. “As we entered the residence, students introduced themselves with a handshake and handed out the cards,” noted San Antonio Teacher Sheri Usher. “ Students commented on how the residents were really nice and that they were touched by the attention they were given.” The students also commented on the fact that residents held their hand while they spoke. In preparation for the visit, students learned that sometimes elderly people appreciate the touch of a handshake. The students also sang a song they had been practicing, Peace Around Our World. “It was a very rewarding experience for the students, and they look forward to returning in the spring,” said Ms. Monson. Matilija students had the opportunity to participate in the "Understanding Hate Symbols Workshop", on Friday January 25th. The workshop, facilitated by the Anti-Defamation League (ADL), through its World of Difference Institute, walks participants through the idea of symbols in our culture. ADL facilitators provided discussion topics and interactive tools to guide audience members through an understanding that although symbols can be used to convey ideas, qualities, emotions, opinions and beliefs, unfortunately, symbols can also be used to convey hate and bias. The workshop at Matilija was built around smaller groups, to allow for greater participation among the audience and moderator. “The goals of this workshop were to create a respectful, inclusive and safe learning environment and community,” noted Carol Paquette, Matilija Assistant Principal. “We wanted an opportunity for participants to reflect on the importance of symbols in our society, and how to identify hate symbols and consider strategies to address these symbols when seen in a virtual or real-world environment”. Matilija parents were also encouraged to attend one of the two workshops provided specifically for adults, and workshop materials were made available at the Matilija office. “We were very pleased with the information and learning environment the ADL afforded our students during the workshop,” said Ms. Paquette. “We look forward to continuing this path of education for our students, staff and administration”. 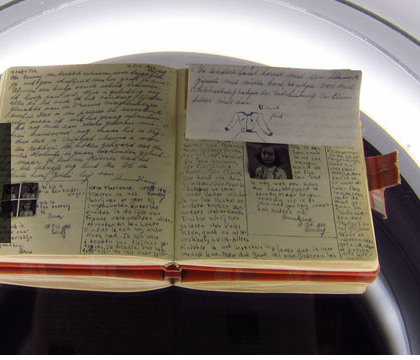 For more information on the Anti-Defamation League, please visit their website here. Student News Anchors (l) Mikyla De Alba and Genevieve Neary; (r) Hector Ortiz Medrano, Joshua Quintana, and Emiliano Rodriguez, deliver Matilija’s Week at a Glance news each week, in Spanish and English. Click on images above to view newscast. Nordhoff High Schools’ clubs provide its students the opportunity to work with like-minded peers who share similar interests and passions, apart from sports or academic interests. “Because our clubs are interest-based, they often cut across demographic lines,” noted Nordhoff Principal, Dave Monson. “We do our best to streamline the process of creating a club, allowing students more choice and voice in these extracurricular activities”. We will showcase several NHS clubs in subsequent news stories over the course of the next few months. When parents visit the Ventura County Office of Education (VCOE) Mock Trials website, and see the opening question posed to students considering this club, “Do you enjoy arguing?”, we can’t help but be encouraged that our teens’ skills in arguing can be channeled toward an interest in Social Justice. 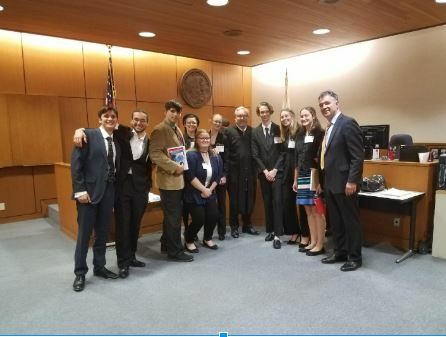 Ventura County Mock Trial may just be the place for them, as this club helps students acquire a working knowledge of our legal system, while developing critical thinking, communication and leadership skills. “The premise of the Mock Trials club is ‘junior lawyering,’ “ noted Kevin Ruf, OUSD School Board Member and Nordhoff High Schools’ Mock Trials Club Advisor. “All participating students learn the basic fundamentals of trial practice during the course of the year.” The epitome of the Mock Trial club is a yearly competition where teams argue a hypothetical case in a real-world court setting, and in front of a judge. While preparing, each student team provides up to four defense and prosecuting attorneys, witnesses, etc. All teams study the same hypothetical case, conduct legal research, receive guidance in trial preparation, and present their case. Nearly 200 attorneys throughout the county volunteer each year as advisors and judges for the Mock Trial competition. Since 1983 the VCOE has partnered with the Constitutional Rights Foundation (CRF) to provide the Mock Trial for students in grades 9-12 throughout Ventura County. Through participating in Mock Trials Club, students enjoy a real-world example of Social Justice that extends and reinforces the History and Social Science Content Standards for California Public Schools. This year’s Mock Trials competition will be held at the Ventura County Courthouse the evenings of February 26th and 27th. The public is welcome to attend, and certainly Nordhoff and OUSD parents are encouraged to do so. For more information on this year’s Mock Trials competition, please visit the VCOE link here. 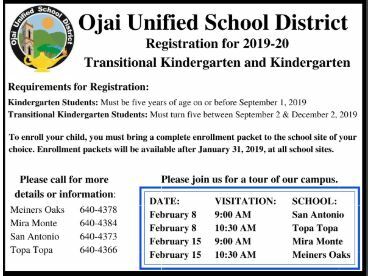 Ojai Unified School District's registration for Kindergarten and Transitional Kindergarten is now open. For families interested in learning more about these options, OUSD is offering tours of the four elementary sites that will be providing Transitional Kindergarten (TK) and Kindergarten in Fall 2019. “TK programs are not preschool classrooms or child development programs,” noted Marilyn Smith, Director of Special Projects. “Transitional kindergarten is the first year of a two-year kindergarten program that uses a modified kindergarten curriculum that is age and developmentally appropriate." A child who completes one year in a TK program, may continue in a kindergarten program for one additional year. Children are eligible for TK if they have their fifth birthday between September 2 and December 2 (inclusive). If a school of choice tour (noted above) has already occurred, parents may contact that school site and request an additional tour time. For more information on the Transitional Kindergarten or Kindergarten options in OUSD schools, please contact the school site(s) listed above. For more information on Transitional Kindergarten or Kindergarten, please visit the California Department of Education's website here.